Ashburton Grove - Arsenal news and Arsenal opinion: Arsene defends players - Bid for duo rejected - Pires the taxi driver? Arsene defends players - Bid for duo rejected - Pires the taxi driver? Arsenal head to Villa Park this lunchtime knowing that three points will take them top of the table, at least until after Manchester United's home game with Blackburn. I think personally it's time for this team to prove they aren't chokers. That they can handle the pressure of being top of the league. So far they've been unable to do that. There is quite a bit of talk around about what's been described as Arsenal's "soft centre". The manager has quite rightly defended his central defenders. 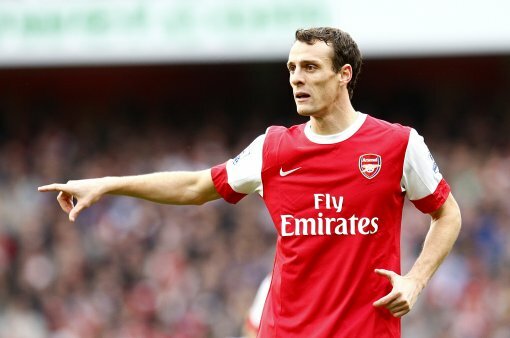 For me Sebastien Squillaci and Laurent Koscielny have performed well in the most part since joining Arsenal. You have to remember it is a steep learning curve for both of them. The Premier League is unlike any of the other European leagues. It's more hotly contested than the Spanish league and certainly more physical than the French league. So the pair have both come in from standing starts and ideally the manager wouldn't have wanted to throw them both in to first team action together at the same time in this league. Unfortunately we're not living in an ideal world. Had Thomas Vermaelen been fit, either one of the French pair wouldn't be in the team. And Johan Djourou started the season with little football behind him, despite a full pre-season. So the French pair have been called upon to perform and stand up to the rigors of the Premier League from a standing start. The manager is right to defend them from people who believe they are not up to it. "They are sharp, good on the ball, defend well. What can I say? "You are entitled to your opinion but for me Koscielny, Squillaci and Djourou are great defenders. "When you don't win your games people always find problems with the team. But is it the main problem we have? I'm not convinced." Where we have been undone is through teams counter attacking against us when we've been taking a set play. Leaving Denilson and Clichy on the half way line has caused us problems mainly because the Brazilian hasn't got much pace and the Frenchman isn't the best in the air. So when teams punt a long ball through and Clichy doesn't win it in the air, their player can flick it on to his pacey team mate who will motor past Denilson. I hope this is an area the manager addresses this afternoon. With the reunion this afternoon with Wenger's friend Gerard Houllier, there has been an emphasis on the health of the two men. And the main reunion will come on the pitch, as Arsenal legend Robert Pires lines up against us. He's been talking about his possible inclusion in the Villa side this afternoon. "It is going to be very strange - only 10 days ago I was training on the pitch with Arsenal. "But I won't offer them any presents - the one who pays me is the Villa owner! "I never thought I would re-sign for Arsenal. It would have been a beautiful dream but things were clear between Wenger and I." There are some more interesting quotes from the great Frenchman in the Daily Star - including the thought that he could have been a taxi driver! A bit of transfer speculation around with The Sun claiming we've had a bid rejected for Dinamo Zagreb duo Mateo Kovacic and Sime Vrsaljko. Elsewhere, Barney Ronay asks in his Guardian column if Arsene Wenger has gone a bit mad. Finally for this morning, I'd like to invite you to take part in a poll I'm conducting on the blog. Its question is simple. Where would you like Arsene Wenger to strengthen the current squad in the January transfer window? Add your vote now. The poll closes at 12 noon (GMT). Match thoughts to follow later, plus team news when it's announced.